Surrender Makes the Joy ever Greater. I pulled my self together before my son came home this afternoon. in the AFC Wild Card playoffs today. the Broncos were playing … for a shot at the Super Bowl. The Loading Dock, in Iowa City, Iowa. We lugged the TV out of the house across town and set it up to watch the game. We had a keg outside and food scattered here and there throughout the store. Daddy was an eternal optimist. but by God, they are OUR team. and were making stupid mistakes in the 3rd quarter when they were finally ahead. He would yell wild obscenities at the screen. The dogs would run to the back yard. We would go about our business knowing that THIS screaming was just for fun. late night Saturday yelling we feared when he drank. The Broncos lost the night of Daddy’s funeral and somehow that was OK. It gave us one less thing to worry about Daddy missing. Bronocs were ahead 20-6 until a few moments ago. We do not have regular TV and I am listening to the game on the same laptop I am now writing on. on the day my heart came unstrung. and my heart breaking while I keep things “Sad but Regular” for my son. I hope to God they win. I found my self swearing at the last Steelers touchdown. Our dog, Henry, jumped off the couch and went in the other room. and never with the vigor I exhibited a few moments ago. He just heard me scream louder than I have ever screamed in this house! just won against the Steelers in OVERTIME! This IS the Year we go all the way, Girls! All the Way to the Super Bowl! You start the day in tears of sorrow and you end the day in tears of JOY! You just never can tell what blessing is around the corner to make the rough patch smooth. with the Surrender you need to make the Joy even greater. All the WAY Baby; All the Way! Daddy, that one was for you; I just KNOW it. ~ by Step On a Crack on January 8, 2012. OK, i read the broncos part first OUCH!!!!!! Reading on. Go Team, well done! I don’t even know the game, I know love and passion and losing a father though. Carolyn! I am NOT a football fan (american football we are talking here…) BUT I do love rooting for a team. It helped so much it was weird. It is what it is and I am going to go with the flow. Tomorrow the happiness may evaporate, or a nightmare could take over. BUT now now I am happy-ish. i agree with your Dad. This is our year! Big days coming up! Is it already Monday in Yeamon? Weds. Yes sir. Your Year! Congrats and keep working it! You surrendered and you WON! Isn’t that something! I think this is definitely your year. Dear Debbie, YOU were instrumental in my reaching down down down which is lifting me up up up! I will never forget this…. I am TEAM DEBBIE all the Way! If we’re going to have a team huddle, I’m in!! GO JEN GO! Heidi You light me up! Thank you…. It is okay for your son to see you sad. Your sadness, grief is natural and trust me it WILL help him in his grieving process to see you grieve. Put on a happy face when you need to, but allow yourself to be sad also. He will be a better, stronger young man as the years pass if he understands death and grief. I think I tend to over compensate for that when you are right: he needs to see me grieve. The poor kid lost 9 (I think) close people within a year of the suicide. He would also count the class pet that died that year. Death has been on his plate for a VERY long time; 7 years now. Seems we do not go a year with out losing another loved one. We tell him that it is our good fortune to have so many people we love. He is also in therapy when the going gets tough. I wish that he did NOT understand death or grief. I wish that for you too my Friend. Very moving, it’s amazing the memories sports teams can bring about. I remember my uncle whenever I watch the seminoles play, he was a die hard till the the day he did die. I think it is a primal thing; trying to bring us back to the bonfire and the Drums. I like to throw my herbs and oils in for good measure! It’s NOT “Mile High Stadium” anymore?!?!? GET OUT. No way. Seriously?!? Good lord!!!! What is the world coming to? Oh I miss football. Yeah, I could go and see a game here… in a bar, lol. At about midnight. Ha. Yeah, not gonna happen. 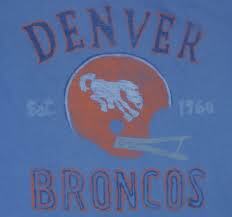 I do miss me some Broncos, though.